Enter once for a chance to get a QUIKLY text that will allow you to enter once to win a trip to Havana, Cuba! BE FAST, this one can end at any time, being a Quikly sweepstakes! 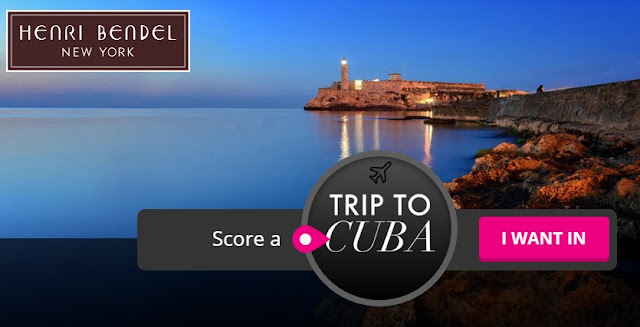 GRAND PRIZE: A trip for winner to Cuba (the “Trip”). Trip package includes round trip, coach-class air transportation for winner from a major airport near winner’s home (determined by Sponsor in its sole discretion) to either Miami, Florida or New York, New York and then onwards to/from Havana, Cuba; the “Art, Music & Hemmingway” five (5) day, four (4) night Cuba tour provided by Conscious Cuba travel agency (the “Tour”); a one thousand dollar ($1,000) Henri Bendel gift card; select Henri Bendel travel accessories; and select prizes from FujiFilm. The total approximate retail value of the grand prize is Nine Thousand Five Hundred Ninety Five Dollars ($9,595). This Sweepstakes ends on 07/10/16 and you can ENTER ONCE to win.